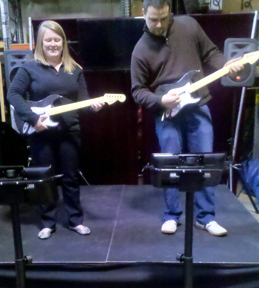 Guitar Hero on Stage - Rock the Rhythm, Lead and Bass Guitar tracks in the hottest music game around. Up on stage, two players can rock together or go head to head to see who will go from Guitar Hero to guitar God in one press of a fret button. Includes: Game system, LCD tv and truss system, sound speaker, 2 guitars, and 1 attendant. Great for ages 8 & up! Related music rentals include: Guitar Props, Dance Dance Revolutioock Band, Karaoke, Strobe Lights, Disco Ball, Bubble Machine and Fog Machines.